How do you stain bone with tea or anything organic that actually stains bone? I have tried tea and it doesn't seem to work very well, it looks good until you wipe off the powder left behind after it dries. I even tried using a fixative but that rubs off easily even after drying, I figure that is due to the powder residue. I did some web searching but came up with nothing. I am wondering what the powder residue is, first of all. Next are some suggestions and questions. Is the bone polished to shiny gloss? When you prepare a piece of bone, or ivory of some sort, or antler, once you have finished sanding an polishing the surface, you should clean any oils, polishing compound and residues from the material. Do not handle it again with anything that will leave a resist of oil or gunk. To clean, (here is where opinions should be made by others) I use fingernail polish remover, or perhaps it may be called acetone. Allow to dry thoroughly. If at all possible acquire acetic acid solution from a photography supplier (this is a very strong vinegar-like concentrate). The use of this is for etching the glossy surfaces just enough for the stain to be taken in to the surface of the material. Place a useful quantity in a glass jar (cleaned of any grease or oils). Prior to subjecting your finished carving to etching treatment, you must prepare a test piece of the same material, polished, cleaned and dried. I would suggest submerging the piece little bit, and after a set number of seconds, immerse it a little further, and again, a little further. Now is where opinions should be offered again. I would rinse the acetic acid from the piece with fresh water. If any absorbent portion has taken in vinegar, I would rinse it in a bit of baking soda in water to neutralize the acid, and then rinse very thoroughly. Then, allow to dry completely. Next prepare the stain and test the test piece of material. If possible, I would turn the sample 45° (from earlier acid submersion) and immerse a little bit, then further and then further again, at intervals of time, perhaps a longer time than with the acid. This is just a suggestion, as a way to test the amount of acid etching that would be needed to open the gloss to accept the stain. Before subjecting the finished carving to the acid and stains, be confident that your tests are what you want for the real piece. I invite you to use the SEARCH function at the top right area of each web page. Use single keywords to find related topics and posts. Words like bone, stain, dye, acid, may bring up any number of places to look for more information from good questions and answers from the members of The Carving Path forum. I hope that you can figure out a way to make your stains to work with your carvings. The powder residue is the tea after it dries. I tried cleaning with alcohol and applying vinegar to the area to be stained, rinsed and dried, placed the piece into the tea and let it soak for hours. It looked good when I first removed the piece and let it dry. I took a soft dry cloth and lightly wiped the piece and most of the color came right off leaving a very light stain but not the desired richness of color that I was looking for. I will try the acetic acid solution and repeat the staining process again. I really didn't want to use fabric dye but that may be the solution. How wretchedly strong is your tea solution? I would recommend that it be horribly strong, way beyond the drinking flavor zone, and that it be really hot too. How long was the bone in the vinegar? When an egg is left in vinegar for days, the shell will dissolve, so with a relatively weak solution of vinegar of 5% or so, the length of time would need to be extended, but that would allow the bone to perhaps absorb more moisture. I do not know about the absorbency of bone, but I would not leave it in the vinegar for days on end like the egg. Have you done tests on similar material so you are not stressing your carved piece? 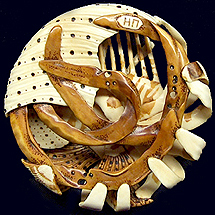 The piece I"m working with is my test piece as it is a copy of a Kerry Thompson design. The original Kerry Thompson piece on the left and my work on the right, I'm now wondering if the original piece was smoked. I looked at some tea stained bone pieces by other people and I now believe that the results that I got are about the extent of color richness that is achievable using tea. Sorry I'm not real good with the camera. Thank you for the illustration and explanation. I don't have a guess as to what method was used for the Thompson design staining, though it looks like a stain rather than smoke. Does it smell like incense or smoke? Now comes the encouragement from someone who has work out there without any protection from copying. To be inspired by someone's work is a chance for one to grow and to learn from that which is admired. To actually strive to copy, or to come close to copying, the work makes me uncomfortable when I see it, though I do understand the merit of the exercise as a teaching tool. I do hope that you will find inspiration within your own imagination, and grow from what you are learning with this exercise. There is an infinity of designs in your head! I don't own the original piece, I just used the design as a learning tool and do not plan to sell the piece. I don't like to copy other peoples work as to me it is a design already done and doesn't need to be repeated by me. I'm just trying to learn how and what tools to use to do the job. Could it be potassium permanganate that was used? Color looks about right. Search the archives here for more info on that. I'm going to second that. Potassium Perm. makes a darker stain. Tea gives a more natural lighter tint. Also bone is porous so if you don't stabilize any color it will eventually wash out. The original does look as tea covered! 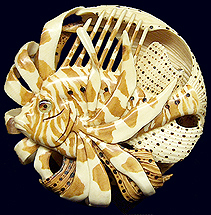 Look at my Lion-Fish which was also covered with tea. First of all if You need to isolate the places which must stay uncolored, use nail lacquer, transparent and uncolored, it'll help You to keep colors balance! The next step, do very very strog tea solution, when it is cold it must be very dark and not transparent! On the mammoth surface I took a piece of cloths or cotton and put on the place wich must be stain, then I added tea, it always must be wet, at least for 2-4 hours, then I opened and watch what color I had, I repeated it 4 or 5 times. Mammoth is very capricous raw, has no organic, that's why staining process can bring crack! Walrus is not so capricous. I don't know what kind of bone do You use! If You have any more question, please, drop an e-mail, I seldom visit a forum! Thank You and I'm sorry for a few critical lessons! Tea staining won't be washed away! I've tested! If You get a tea dust on the mammoth surface, it means that You didn't stain it deeply, You simply colored its surface. You really needn't to stabilize tea dye! It is very strong dye! More stronger than KMnO4!!!!!!! If to be frankly, I don't like KMnO4! In a couple of months it disappeared at all. I think it happened because I didn't use hot solition. I use cool solution of tea, I'm always afraid to use hot, because mammoth is too capricous and full of surprises! I usually get the depth of staining about 1mm,, it is more than enough! I've got some messages they say that my explanation is not good! First of all, I'm sorry for my English, I'll repeat the whole process step by step, I hope it'll be more understood for others! 1. I've only stained mammoth tusk and walrus tusk, I've never stained beef bone! That's why I can only describe my processes! 2. I don't use any acid on mammoth surface, it is too dangerous for this kind of raw, it has a lot of chalk inclusions and no organics! I apply tea, walnut and yashabushi dyes on the well-polished surface if I need to get very contrast places without any shadows! The places which must be uncolored ivory I protect with NAIL LACQUER!!!!! It must be uncolored transparent lacquer, because it'll let You to control all process, palette of colors, how they are intensive for knowing when to stop! You also can see missed unprotected places in time and add some lacquer where You need! After staining You can delete lacquer with acetone! 3. I use black Ceylon tea, broken leaves, called "Chelton" in my cause, cook very strong tea, almost as for drink, but very stronger! The stronger tea the intensive color! When it is colder, Tanin becomes visible as a dust inside this solution! I don't put the netsuke into this solution, I use white cotton which keeps tea inside itself very long time, I put small pieces of cotton with tea on the places of netsuke which must be stained, I always add some tea with a brush when it is getting dry! In 2-4 hours I open staining places and see what I have, if the color is not intensive as I wish I repeat this process again and again, sometimes it take some days for more intensive color! When I get what I want I wash this netsuke with solution water/alcohol - 50/50, it is like Vodka! Then I wash away nail lacquer with acetone and do very easy polishing using "like Vodka" solution and a pieces of white cloth. Then I dry netsuke a bit, the next day I cover the whole netsuke with my protector, it is White Spirit with paraffin, dissolved paraffin goes into mammoth very deeply and close all tiny pores. The netsuke won't get patina and won't became dirty in some years! In the situation with beef bone, I think You should do what Janel wrote to You with acid and then to protect places which must be uncolored, put it into the solution of very hot tea! You should keep it there about 2 hours then to check intensity of color! If it is not enough, put it in the hot tea again and again! I think in some times it will be right! Be ready that it can take many hours! But not put it for the whole night, the color can become too dark!!! Hi Natasha, I understood your staining process but now with that you mentioned that you use black tea leaves helped. I have been using tea bag tea and I just read the ingredients and found that it is a mixture of Pekoe Orange and Black teas, probably why I'm getting the color that I'm getting. I am using beef bone from a pet store and these types of bones are sterilized with steam making the bone more brittle and it may also affect the way the bone takes the dye, I don't know. I have my test piece in the staining process right now but, I didn't have any cotton so I'm using gauze cut to fit the areas to be stained. This is all great information as I have tried to learn this from other places and either nobody knew or they just didn't want to help. Thanks and your work is most wonderful and inspiring. I just wanted to point out something interesting that I spotted in Natasha's photos of the tea stained fish carving that some may have not noticed or thought of. If you look there are lighter and darker areas such as the spots on the fish where she used the nail polish to seal the areas that were not to be stained, very creative. Also, staining areas to a light shade and then masking some of the light areas and re-staining to darken the desired areas for a nice two tone effect. This is all good stuff and we are all learning and sharing ideas here. I didn't polish the area to be stained before staining, it had a dull surface. After I stained the piece the first time, let it dry and wiped the stained area with a clean dry cloth it looked like I had polished it, the stained area should have a satin finish when completed. I tried the vinegar but it didn't help, I'll have to try getting some acetic acid solution if the cotton staining process doesn't work. I have another piece that I have been using for testing and I didn't get all of the tooling marks out of the area to be stained and I didn't see them until I stained the piece. Also that piece had a lot of porosity and now the piece had ugly little dark spots that can't be removed. Scott- Orange Pekoe is black tea- it's just a size grading of the leaf fragments. Nothing to do with color or origin. Go ahead and keep using it if you've got lots. haha...nah brent, im learning to mate....its all very interesting. 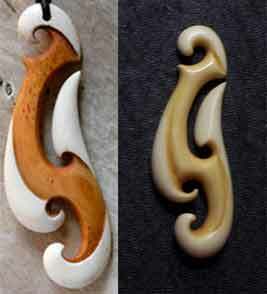 What IS interesting is that im in NZ, a country fairly renowned for its bone carving....but do you think people want to share their information?? Not at all. Ive emailed a few guys over here and i NEVER get replies. I was very disheartened until finding this site. yourselves. Do You know HOW? Janel's advice then to stain! Hi Natasha, I just love your name. Anyway, the thought of the pet shop bone being steam treated causing staining problems crossed my mind. I tried what you had suggested and started the staining process before I went to work and 8 hours later the color was no better than the photo I posted. I have been meaning to search out some local butchers for raw untreated bone but have never got a round to it. Where I live there are not many if any real butchers, most places purchase there meats preprocessed. I can remember years ago when I was a child going to the local butcher shop with my mother and you could get anything you wanted freshly cut daily, Things have changed over the last 40 years and the local butchers have all vanished and everything seems to be processed somewhere else and shipped to the stores. I know how to prepare the raw bone if I can find it. Polishing of the areas not to be stained was done and the area to be stained was cleaned of all tooling scratches and marks but left in a satin finish as that is the desired look for the areas to be stained, although after the first staining and wiping with a dry cloth the area that was stained now looks as if it was polished. Hey, it's just a learning piece and I'm not going to get discouraged this easily. I will get this bone stained or find one that I can stain. I will try to find the chemicals to work Janel's suggestion but again local photo supply shops are hard to find anymore with the age of digital photography, where would we be without the internet. I don't know where I can find acetic acid, there is one photo shop supply in my area and no listings for acetic acid in their chemicals. I did a web search and all I get is what it does when mixed with other chemicals or it's use in food processing or the MSDS. I think You'll find acid in a supermarket! It is even available here, in Moldova! You should search better on the shelves between other acids! Mine was bought in a supermarket!